I bought an Open Box M easel lately and I was so excited to try it out. This morning, I went to a small park not far from my home and did my first plein air of the year. It was a cold and cloudy day. I set up my clean and shining easel and carefully placed some fresh colors on the palette, afraid of contaminating the new thing. Well, life was getting more interesting. The wind came and it was getting colder. After I just blocked in my darks, it started to rain. Oh boy, using water as the medium for an oil painting was totally new to me. My paint stuck on my brush like a lollipop and refused to stick to my glass palette. I had to mix my colors on the canvas. My fingers got numbed, my hair was wet, and my new Box M..... Well, it was no longer new any more. "I think it is the time to go home" I was telling my stubborn artist's mind. I covered my canvas with whatever colors I got on my brush, and put away everything clumsily in the car. As soon as I rushed out the park's gate, Oh my Lord, the Sun came out. What a wonderful plein air day I had! In spite of all the miseries, I sort of like what I did on this painting. Light color: Ultramarine Blue + White + Shadow color. I really like this one. 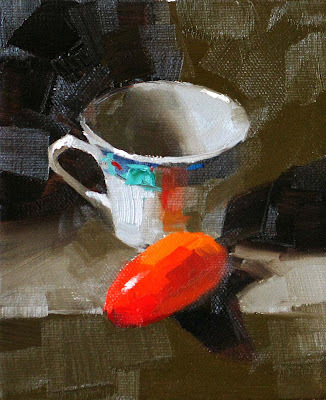 I am glad I can make a painting work without using cadmium colors. We have this kind of odd shaped tomatoes growing in our yard. 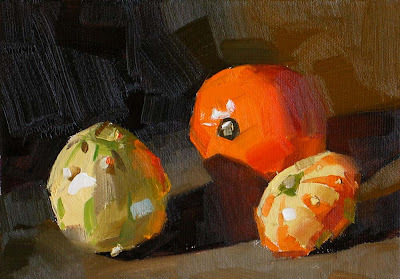 I balanced one of them on the edge of my still life stand to create the shadow shape I like. I am glad I am back to my classic style before I got lost in the "contemporary" la-la land. So I am a good boy today, but I can't guarantee you that I won't go crazy again. I like that odd shaped tomato balancing on the edge. At this moment, I want to say "Thank you" to all of you, for your support. You make me very happy for this a couple of years. Happy Thanksgiving!!! I don't know this painting is good or bad, but it is definitely new to me. It is a pure knife painting and I have crossed the representational border. Doing abstracts is not my favorite, but it is kind of fun coming out of my comfort zone once a while. It is a good study on paint work and effects. Ajijic is the Mexican town I did workshop several months ago. It is really beautiful. 1. I have a very good sense of directions. I can always find my destinations even crossing the glob if needed. 2. I cannot deal with numbers in English. So I often make mistakes when I communicate if numbers are involved. I was buying a piece of art once from a gallery online. I gave them the wrong zip code, the wrong phone number, and the wrong credit card number. 3. I did studied subatomic physics in college, but I don’t know anything about the string theory. 4. I got my first ticket before I got my driver’s license. 5. I belief the world will be destroyed by computers rather than nukes. At the last weekend EAST show I met quite a few friends requesting information about my workshop in Austin area. 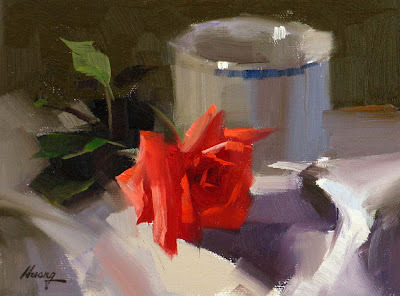 I have just updated my workshop page in my website and I will teach a three-day still life painting workshop at Austin on May 15 - 17, 2009. Please contact Karen Wilkerson at: karenwil@austin.rr.com for detailed information. Thanks. I am sorry for this short short notice. 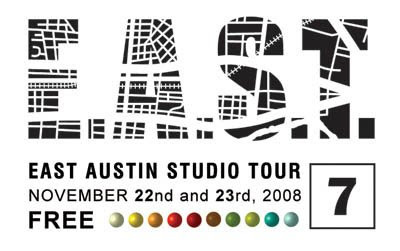 I will show my work at the EAST show this coming weekend. If you are in the Austin area, you are more than welcome to come to my show. I am located at Studio #70: 1406 Smith Rod Ste D. This is my first time to show Giclees of my work. I have not got time paint lately. Every night I was busy stretching canvases and framing. I don't know what I am expecting, but it will be definitely interesting. I am excited about it. This one shows my typical style of painting if I have one; my typical composition, my typical way of using color, and my typical way of illumination. 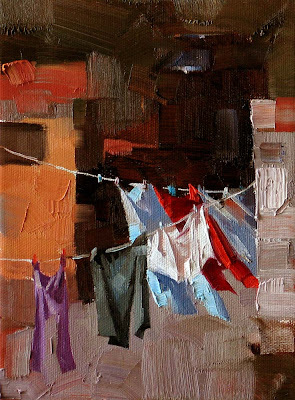 I remember a master artist has said that a style is the limitation of the artist. I agree. 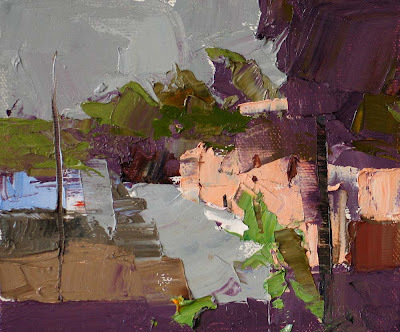 In my art practice, I never deliberately pursue a style. I only know what I like and what I don't like. Two days ago, our washing machine quitted. I tried to fix it, but it was much harder than I thought. We have to buy a new one I am afraid. What a shame it was. It still look new to me and most parts still working. This reminds me the old days. We hung cloths and sheets under in the open air to dry. I still remember the smell of the Sun. I did this painting from a photo I took in Mexico. I started (again) painting landscape now. It is more difficult to me since I have not done it enough. We will see. Maybe I would like it. 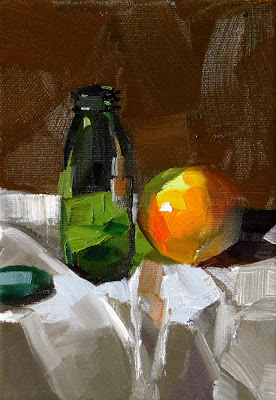 Transparent objects like bottles provide great opportunities for putting high chroma colors on a painting. 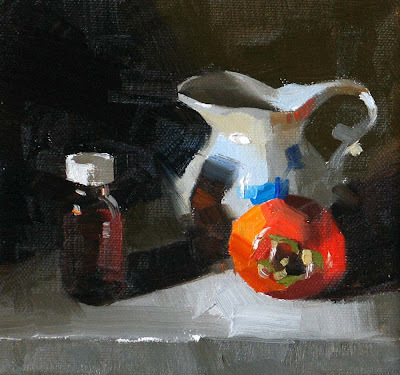 Unlike the opaque objects, the light filtered by the bottle remains high color intensity. In contrast, the light reflected from an opaque object, like the orange, usually gets bleached, and pushing the high chroma color into the area closer to the shadow.... bla, bla, bla.. You know what I mean. I had too much technical junk at work today. My brain has not shifted to the artistic mode yet. "Go-erds" is way to say "gourds" in Deep South. I learned it when I was in Mississippi last month. I really enjoy traveling. It is a good way of learning new things. 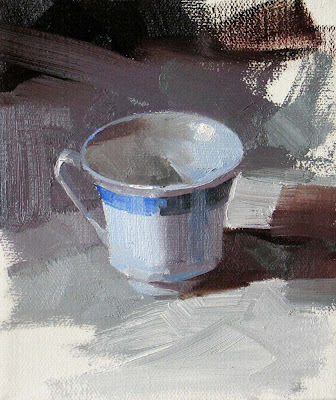 I have just updated my workshop page in my website. 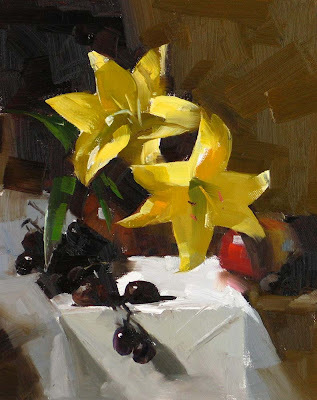 If you are interested in taking one of my workshops in 2009, please check Here (or click the yellow "Workshop Info" button on the right) and contact the workshop organizers to get detailed information. This is a partial list at this moment. There are still several more in the middle of processing. I will post again when they are ready. I am looking forward to meeting you or seeing you again. 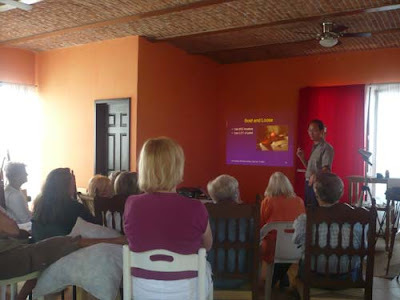 My wife took the photo above when I was teaching a workshop in Mexico in September. I use PowerPoint presentation, painting demo, and individual assistant to make the workshops informative and fun. This is my first try of painting orchid. I had some hard time with it. My palette did not provide the colors I need. I could not mix the purple I want. 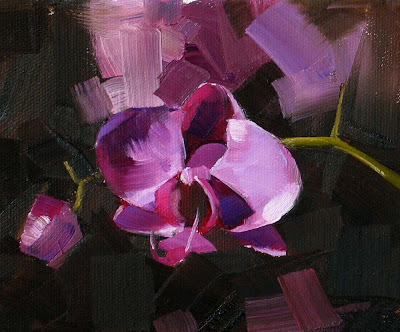 If you have the experience with orchid painting, please help me out. 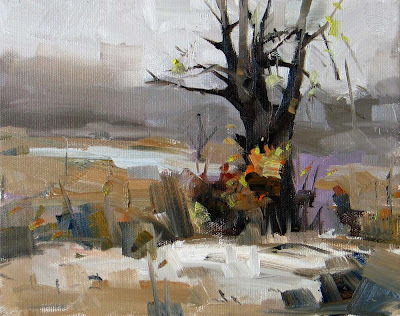 This is another demo I did at the workshop. I got a nice secondary light source from a winder on the right. The cooler light made this painting with a morning freshness. I did most of my paintings in evenings under artificial lights. So, I really enjoyed having this natural light shining on my setup. I have just completed a workshop at Round Rock, TX. I want thank Denise Larue Mahlke and the Art Center at Williamson County for making this workshop possible. I saw quite a few old friends and made many new friends as well. We had wonderful 3 days painting together. Thank you all so much. This is one of the demos I did on the workshop. It put quite a challenge on me, but it turned out all right. Hope you all like it.